08 | September | 2009 | J&A + fun! Lately Kaylee is much more interested in the boxes things come in than with the toys themselves! I think she looks adorable in these pictures so I thought I’d share! These were taken at my moms house one day in July! Trying to get her legs under her and situated so that she can stand up! She worked really hard for about 5 minutes! She is very determined and really works through things without getting frustrated! It is fun to watcher her problem solve! “I told you I could do it! !” Both of my girls have no problem showing lots of pride in their accomplishments! Finally Kaylee makes it out of the box and comes to rest with Emmy and Mommy on the couch! Then she gets bored of just laying there so she goes over to Grandma! Because everyone know grandparents are way more fun than moms and dads! Then Emmy decides she wants a picture of her but she doesn’t want to get up off my lap…so this was my attempt at taking an in focus picture from 1 foot away! And finally…Kaylee is back for one last shot at getting Emmy up to play with her…even if it means eating her foot! I can’t stop laughing every time I see this picture…it just some how sums up her whole personality! What a funny kid! So…how is everyone?? It’s been a while! What a crazy busy and fun summer we had!! I can’t believe that I haven’t posted anything since the 4th of July! Which was a very fun trip and very fun posts…so at least we ended on a really good note! The rest of the summer was fun also and so…now that Emmy is in school and Kaylee is on a nice nap schedule and things are calming down I can continue the epic of the Baker Family summer! My sister Christina is a really good Tennis player so whenever she comes to town we always play tennis and she beats up on the rest of us! 🙂 Actually my dad and Alex are pretty good too so maybe she just beats up on me! 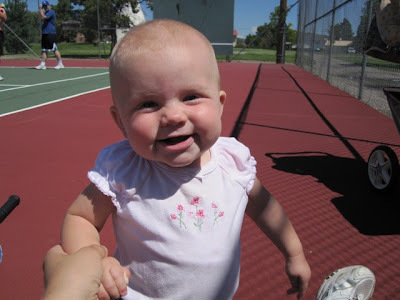 Anyway, the girls and I met my family over at the tennis courts one day and grandpa and Christina taught Emmy how to hit a ball! She did pretty good! Here’s Aunt Christina after a heated game with my dad! 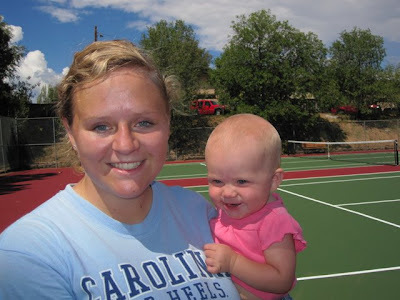 Kaylee was so happy to sit and watch them hit a tennis ball back and forth! My dad and Christina! Doesn’t my dad look good? He has been playing tennis, going to the gym, and walking 5-10 miles a DAY! He is doing great!! Okay, this is one of my all time favorite pictures of Emmy! 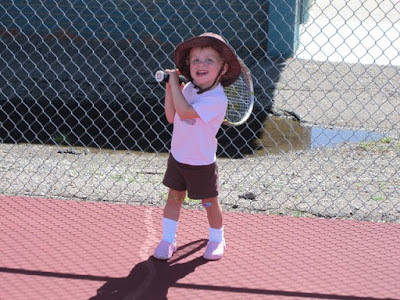 She just looks like such a fun little kid…complete with band-aids on both scraped knees! Okay, one more shot of the little cutie with her pink Royals shirt on and her band-aids! Kaylee entertained herself by crawling around and chasing the stray tennis balls! She is on the move all the time and she is growing so fast! What a cutie! And finally, I had to put some pictures of Alex in! He is a really natural tennis player and someday when we get some more time to ourselves and he can play more I bet he will be really good! Anyway, these pictures are funny because this one is his “YES” face that he makes after a good play! And this one is his “NO” face that he makes when he loses a point! He gets very animated when he plays sports…Just in case some of you haven’t ever played sports with him. I think both faces are cute though…so I thought I’d put them both in since I captured them on camera!